You’ll be weaving 28 picks and aim for about 2 1/8″ in total. Thank you for the idea about checking the hardware store for steel rods – for some reason it didn’t occur to me that these would be in hardware stores! I’ll have to check my local store. Hi Nina, I noticed the steel rods at the local hardware store. I am in Canada and I was at a Home Hardware. They had them in different lengths/thicknesses. Not sure if this will solve the problem but a steel rod would be heavier than a similarly wooden dowel. I am not quite at that point yet in my weaving. Hope that helps. Am weaving along doing the cramming and denting linen project and loving the linen. 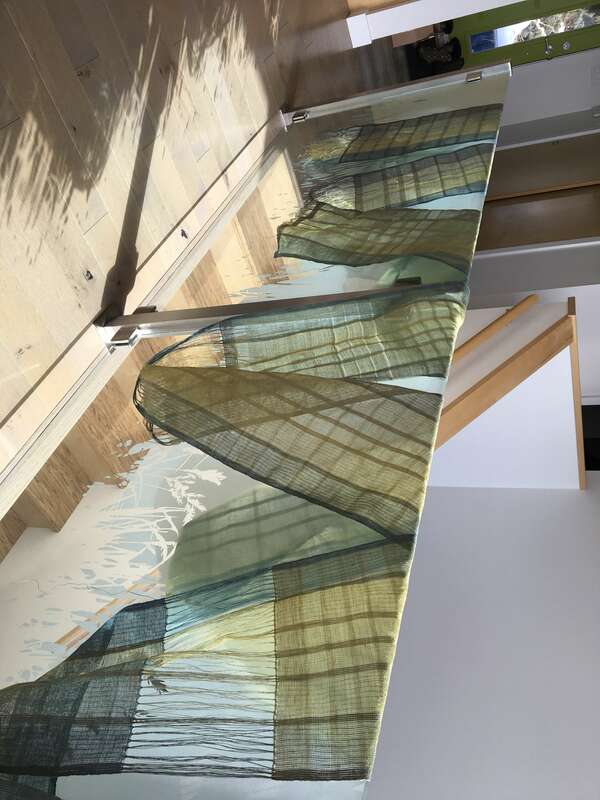 The only problem I am having is that the open sections of the warp have become loose (as Jane said they would) so I weighted the open warps with a rod and fishing weights (as per her instructions in the video). However it is not helping. The warp is still quite loose in the open parts even though I added more weights. It is becoming seriously distorted. I am wondering if this is because I had to use a wooden dowel instead of a steel rod as I do not have an extra steel rod for my loom. Do you think this is why the loose warps are not behaving? Where does one get an extra steel rod anyway? I absolutely loved working with the linen! 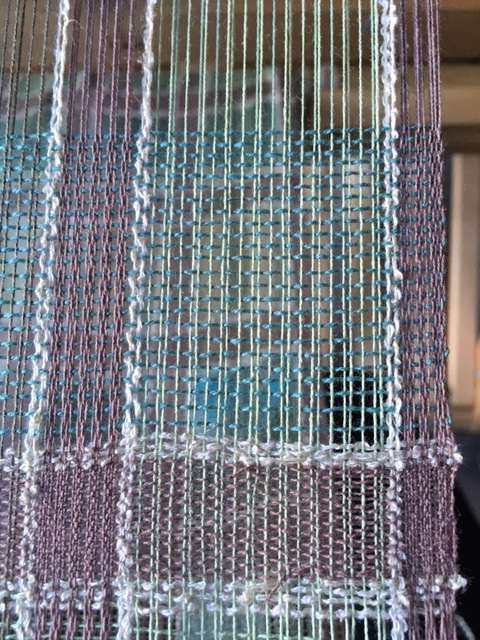 The sheen and the texture just made me so happy as I was weaving. 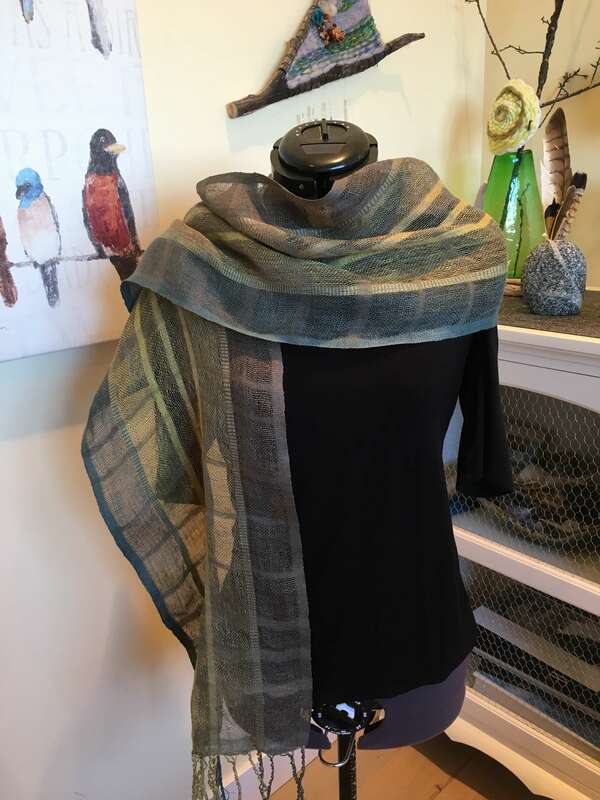 I used linen weft for two of the scarves and one shorter sample piece and silk weft in old man’s beard for the other scarf. 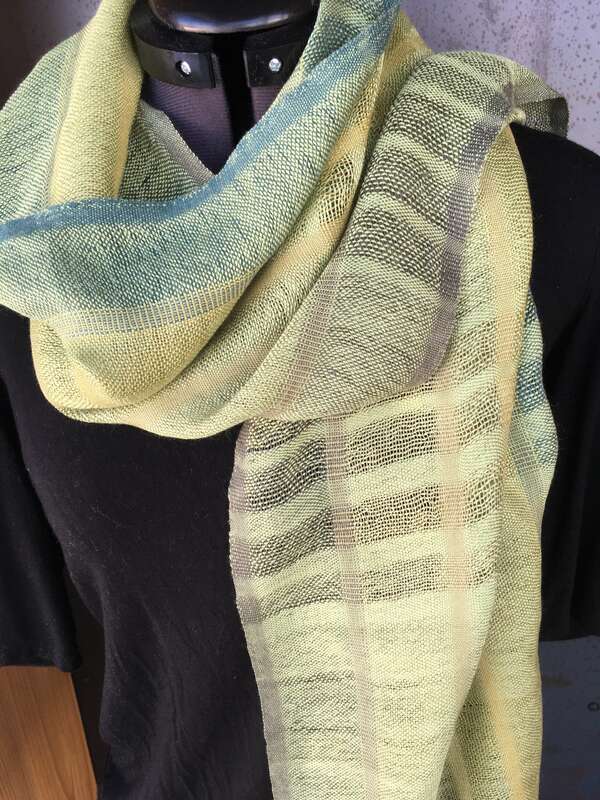 I have a question about finishing the linen projects. 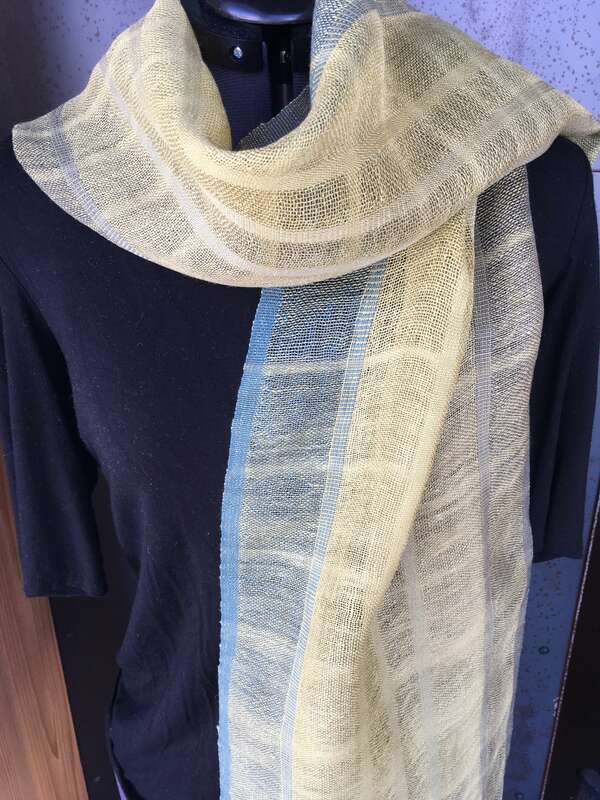 I haven’t started weaving it yet (work commitments) but I was wondering if finishing the linen was any different from finishing cotton? 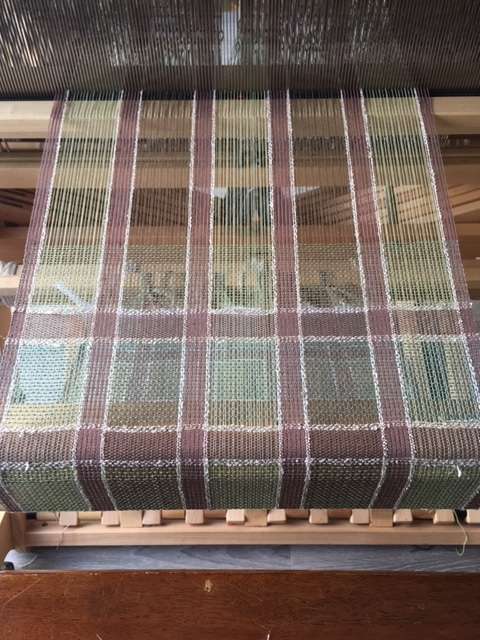 A bit behind – just did a warp for Episode 1 Season 3 and wove that with 2/16. Then thought I would resley and try the crammed and dented and thought I would try the second re sley – If you follow denting as written it turns out to be 5 1/3 inches. If you change the 2 to a dent to 1 to a dent to get to ep1 12 – you have 9″ in the reed. Is that correct? 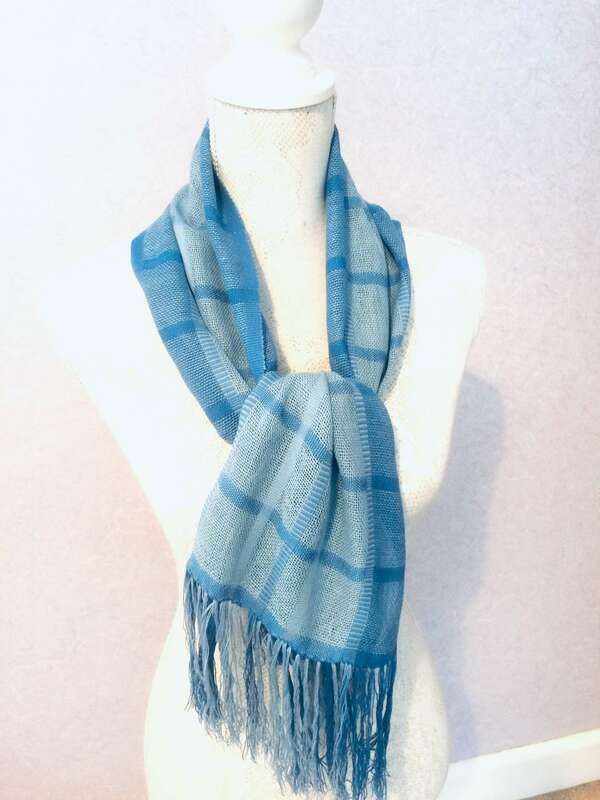 Your blue scarf is beautiful Jacqueline. Really enjoyed this episode. 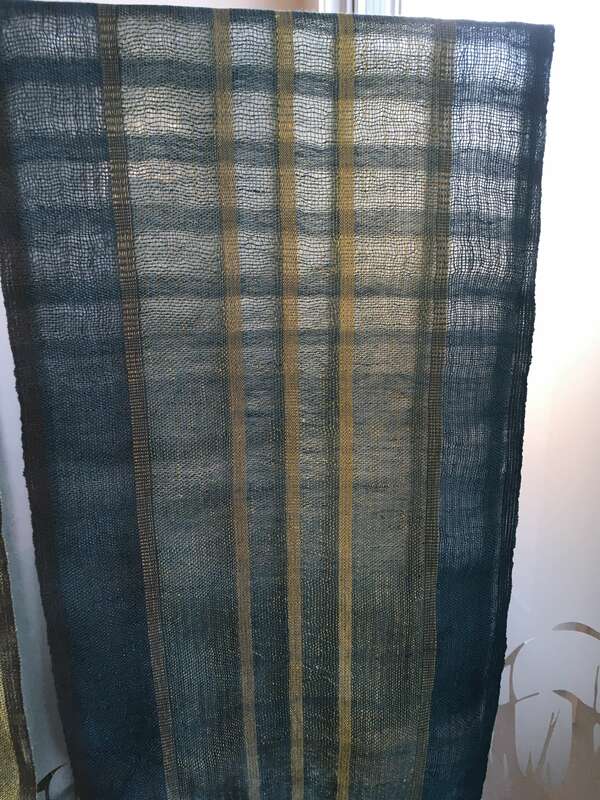 I used 2/16 cotton for both warp and weft in two shades of blue from my stash. I will look out for linen that Jane uses, but I couldn’t easily source it in the UK. Since taking this photograph, I have twisted the fringe which gives it a much nicer finish. Woven on my Louet David 2 and I didn’t have any tension issues as I only warped enough for a sample and the scarf. Done! and happy with results, a small amount of collapse present. Used 2/20 and 2/16 cotton and epi 40 and 15. Oh wow Kathleen, can’t wait to see if finished and see how the boucle acts. Lovely colours! 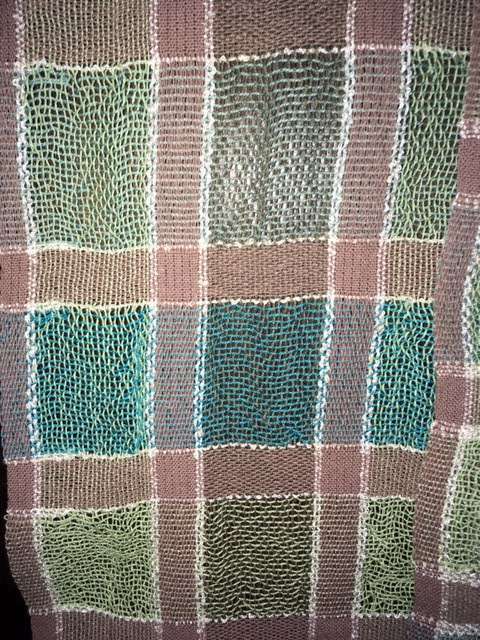 After shoveling snow I came in to start my weaving, after 1 hour I got up and well lets just say I couldn’t straighten myself upright. I am trying to use fibres that I have in my stash, so I used 2/20 cotton from Lunatic Fringe. 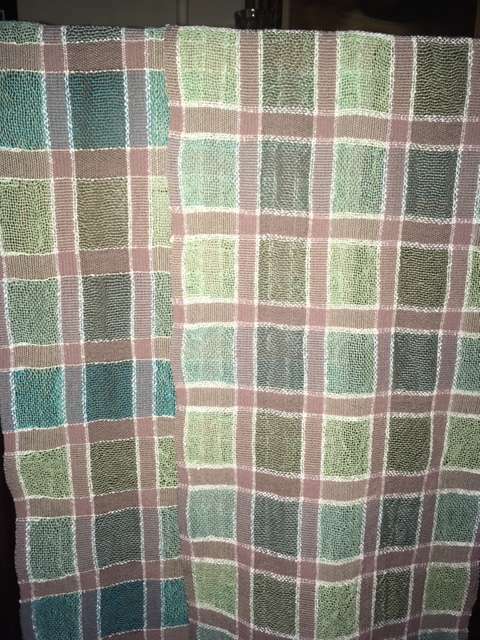 I also had some boucle that I placed on each side of the cram cotton. I suspect it will shrink more and hopefully give me a scalloped edge in the weft. Great, Nina. Glad it worked out and looking forward to seeing the result! Thank you. 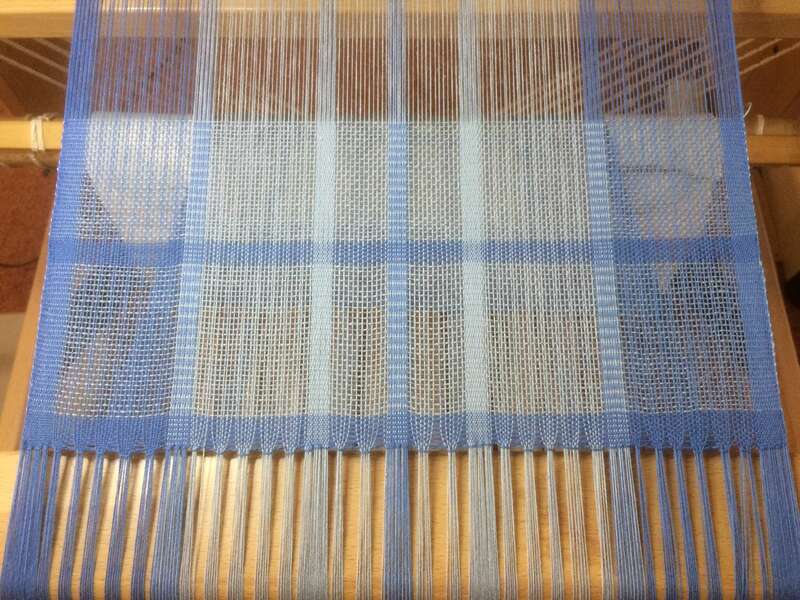 I thought I should spread the warp out in the raddle normally – just wasn’t sure how many ends to put in each 1/2 ” space in my raddle. So I divided the ends (280) by 13 (the stated width of the warp) and came up with 21.5 ends per inch which gave me a little over 10 ends per 1/2″ in my raddle so I put 10 ends in each 1/2 inch space. Seems to have worked out ok! (I am using a regular raddle on an Oxaback Lilla loom).